RAW is not an abbreviation but literally means "raw" as in "unprocessed". A RAW file contains the original image information as it comes off the sensor before in-camera processing so you can do that processing afterwards on your PC with special software. The advantage of RAW format is that it preserves the original color bit depth and image quality. In addition, such camera settings as sharpening, white balance, levels and color adjustments can be undone and recalculated based on the raw data. Also, due to 12 bits of available data in RAW, you are able to extract shadow and highlight detail which would have been lost in the 8 bits/channel JPEG or TIFF format. The disadvantage of this format is that RAW formats differ between camera manufacturers, and even between cameras, so you have to use dedicated software provided by the manufacturer. But this problem can be solved by third party image editing and viewing software packages which are becoming RAW compatible with most popular camera brands and models. 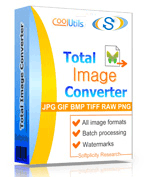 Total Image Converter supports almost all RAW formats and can convert RAW to JPEG, TIFF, PNG, BMP and many other image file types.